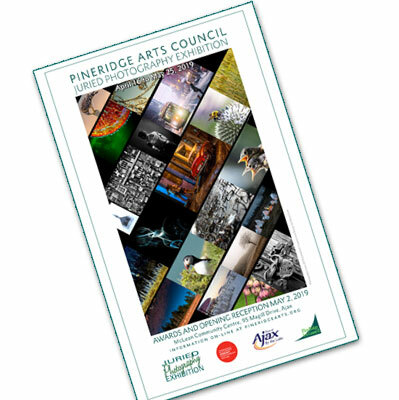 PineRidge Arts Council is proud to once again be part of the Scotiabank CONTACT Photography Festival, the largest annual photography event in the world, and a premiere cultural experience in Canada, with over 200 exhibitions and happenings from May 1-31 in the Greater Toronto Area. Founded in 1997, CONTACT is a not-for-profit organization dedicated to celebrating and fostering photography and related media with an annual Festival in May and year-round programming in the CONTACT Gallery. CONTACT’s community initiatives foster a wide range of interest in photography and enable meaningful exchanges between the people who make and present art, and those that view it. The foundation of CONTACT was based on an open call to participate, enabling emerging artists and photographers to show their work concurrent with exhibitions of works by leading professionals. Today the Open Exhibitions continue to encourage neighbourhood involvement at local galleries, community centres, educational and international institutions, cafes, retail stores, and many alternative locations. Doesn't your photography belong in this show? Thanks to our 2019 sponsors and partners! Leif Petersen is retired from a 32 year career with General Motors and Detroit Diesel Corporation (DDC), a division of Daimler Corporation. During the last several years of his career, he was DDC’s Vice President responsible for sales and service in Canada and the international market. He is currently the President of the Oshawa Camera Club, Vice President of the Ontario Council of Camera Clubs (O3C) and Treasurer of the Toronto Focal Forum, a group of avid photographers, who print and evaluate their images. He is a CAPA and O3C accredited photographic judge and regularly judges photo competitions for O3C member clubs. Leif also serves on the Advisory Committee for Durham College’s photography program. He is an Ambassador for Panasonic Canada, which involves evaluating their equipment and promoting their technology. Leif has been involved in photography for over 30 years and his skills have been recognized in regional and national competitions and publications. He travels extensively throughout the world, primarily for photography, and leads tours to Northern Norway and India. His photographic portfolio covers several genres: travel, land and seascapes, architecture and macro. He enjoys sharing his photographic knowledge by offering workshops on various aspects of photography including software applications, macro photography, black and white photography, printing, etc. He prints, mats and frames his own images for exhibitions and retail sales. You can view some of Leif’s work at http://leifpetersen.ca and contact him at lhpviking@hotmail.com. Photography Exhibition. I thoroughly enjoyed the experience. The 128 images submitted represented all photographic genres. Indeed, it was a challenge to select the final images for the exhibit and to include as many of the photographers as possible. Although I’m very involved in photography, with printing being one of my favourite aspects, I was pleasantly surprised that many of the images popped to life in their final printed form. It definitely supports my opinion that photographs deserve to be printed, shared and exhibited vs. left to obscurity on our cell phones, tablets and computers or in the cloud. photographic talent. Those purposes have been achieved each year and this year was no exception. Congratulations to PRAC for your success! especially pleased with their achievement….congratulations. various area venues - galleries, restaurants and offices. I look forward to seeing you at the May 2nd exhibit opening. Enjoy the show!